Exploring. Writing. Sharing the journey. 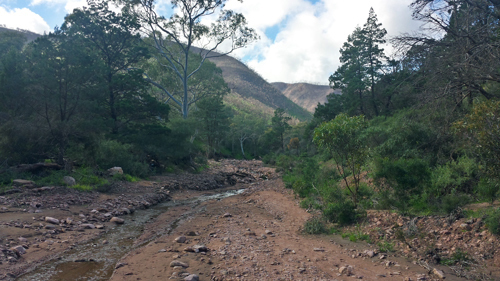 Napperby Gorge is hidden in the Southern Flinders ranges in the Mid North of South Australia. Perfect for a morning or afternoon stroll, or bring a picnic and spend more time exploring, either way you are sure to enjoy the natural beauty of the gorge. 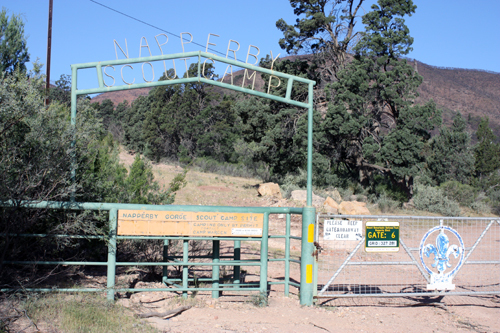 Just 15 minutes from Port Pirie, and 2 1/2 hours from Adelaide, Napperby Gorge is accessed through the Scout Camp on Gulf View Road. A walking trail veers slightly to the left as arrive at the scout camp buildings, or for an easier walk, follow the road straight ahead. Both options will take you to the creek and into the gorge. Bushfires in early 2014, followed by heavy rains, have naturally cleared the scrub and undergrowth. This allows for easy walking as you follow the creek northward. 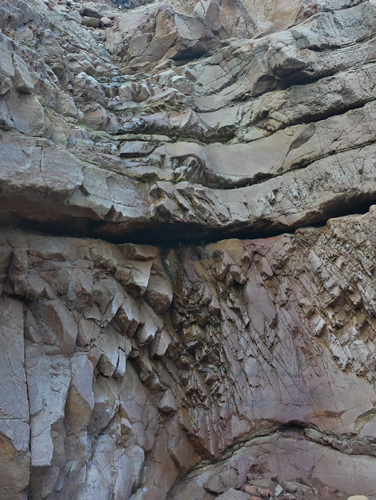 Shortly after passing a high, rocky, cliff-face you find twin waterfalls. These are only about a metre in height, and it is relatively easy to climb up the rocky ground beside them. The creek ahead passes more closely between the mountains on either side as the gorge becomes narrower. 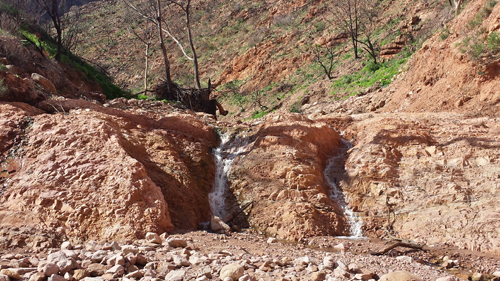 Evidence of other 'waterfalls' that would only run after heavy rain can be found on either side of the creek. At the end of Napperby Gorge you arrive at 'Hell's Gate', a sheer rock cliff, that would be spectacular (if somewhat dangerous) when water is flowing over it. The history of the area, and how or why this came to be called Hell's Gate seems to have been lost, however, some locals speculate it may have been named by early settlers who would drove cattle and sheep through the gorge.